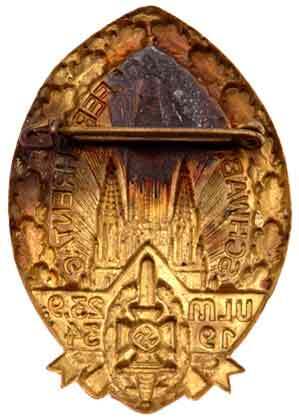 High relief, stamped brass badge, the black area above the strong brass pin is oxidation (not corrosion) from the running lead solder used to attach the pin, very light wear. 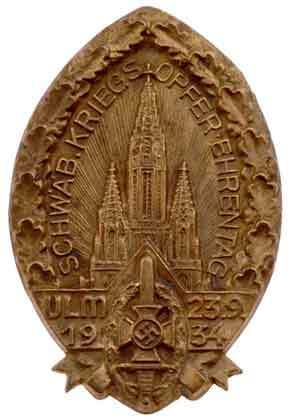 The Ulm Münster Cathedral (1377-1891) pictured on this badge has the world's highest church steeple (161.53m high and 768 steps). From 1933 to 1935, the nazis constructed a concentration camp for political opponents on the Kuhberg, one of the hills surrounding Ulm. The Jews of Ulm, around 500 people, had their synagogue torn down after Kristallnacht in November 1938. 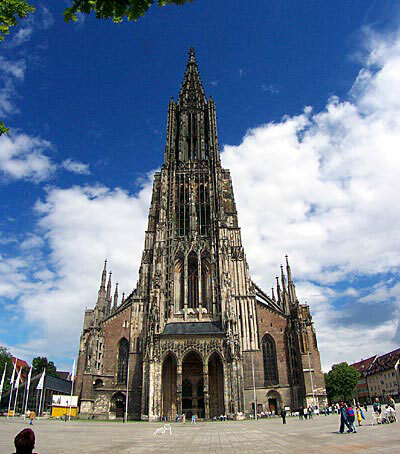 During World War II, the city was heavily damaged by allied air raids. The most serious attack occurred on December 17, 1944, killing 707 inhabitants and leaving 25,000 homeless. At the end of the war, over 80% of the medieval city center, before the war one of the largest in Southern Germany, lay in ruins.